카메라를 찾고 계단에 앉아 슬픈 여자의 초상화입니다. RED 에픽에 총. Senior couple sitting in the kitchen and looking at the laptop. Smile. Happy together. The woman cooked food. In the kitchen at home. Grandpa. Croissants. Shot on RED Epic Camera. employee with red long hair happy smiling looking at the camera. 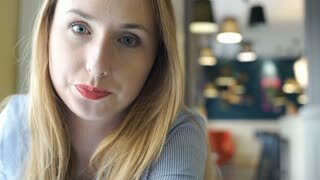 portrait young caucasian woman sitting at the workplace in modern office.